A methodology of investigation and diagnosis on the built patrimony of historic centres in seismic areas is presented with the aim of collecting an extensive knowledge on the structural typologies and behaviour of historic masonry buildings. This investigation is also the base for the prevention and/or repair of damages caused by earthquakes. Small historic centres or residential buildings in larger centres have been considered for long time as “minor architecture”, but they are meaningful testimonies of the local cultural heritage and express the evolution of a society and of its cultural identity. The results of the investigation carried out on different Italian historic centers, allowed also a critical review of the reliability of the analytical models and of the effectiveness of the repair techniques applied in the past decades. The guidelines emerging from the research results are here presented. A “minimal” diagnostic investigation program is also suggested, in order to support the designers in their projects and to set up appropriate mathematical models to study the vulnerability of the structures. The study of the effects of the earthquakes which struck Italy, in Umbria and Marche regions in 1997, in Abruzzo region in 2009 and in Emilia region in 2012 showed as most retrofitting interventions realized during ‘80s and ‘90’s, after previous seismic events, were carried out with upgrading interventions made by incompatible materials and structures. These interventions still consist of: substitutions of timber floors and roofs with r.c. (reinforced concrete) structures, jacketing, grout injections,etc. Most of them caused unforeseen and serious out-of-plane effects (large collapses, local expulsions), due to the “hybrid” behaviour activated from the new and the old structures. That effect was not clearly predictable by the existing assessment methods, which were then also suggested by the Italian standards. They proposed in fact analytical procedures based on hypotheses often not easy to be satisfied in old historic stone masonry buildings, as the effective strong connection among the structural components and the presence of stiff floors, both characterizing the favorable “box” behaviour of buildings under seismic actions. It was also clear that the main cause of inappropriate choices of intervention techniques was due to the lack of knowledge on the material and structural behaviour of the peculiar type of construction techniques used in the past centuries for the buildings. A good level of knowledge of the historic masonry building can be achieved considering: i) the geometrical, technological and constructive characteristics of the surveyed buildings; ii) the material and structure properties; iii) the materials and the techniques used for past and modern restorations; iv) the damage state, the possible collapse mechanisms of the buildings and structures, considering also the ones that were already retrofitted. This last point is aimed to put in evidence the vulnerability of the structures. The object of the above mentioned research should not be the single building, but the whole historic centre (even if small) considering also the complex buildings formed by different “structural units”. These units should be clearly recognized to understand the eventual historic evolutions, the interaction among these units and the global structural behaviour of the complex building, also called “aggregate building”. Hence there is the necessity of defining a “minimal” investigation program, eventually carried out by the municipality or by other wider districts, in order to support the designers in choosing the right analytical model for the safety definition and the appropriate intervention techniques for their projects, part of the rescue plans. In order to collect properly the data, a computer method, as a data base, is, as a consequence, necessary, with the support of a survey template, to be filled partly directly on site and partly with the help of historic documents. The extensive damage survey of the buildings was useful to produce an abacus of the typical damages occurring in the different constructive typologies, as already previously done for churches (Doglioni et al.,1994), and a critical evaluation of the repair techniques and suggestions for future interventions (Penazzi et al. 2000; Binda et al., 2003). The better knowledge of the damages led to the consequent systematization of the mechanical models able to describe their specific behaviour, f. i. by kinematics models, both for in-plane and out-of-plane mechanisms. 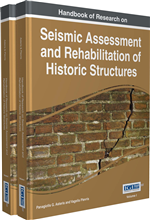 So, one of the purpose of this research can be to provide a useful tool for: drafting a series of recommendations for the design, execution and effectiveness evaluations of non-invasive repair and strengthening interventions, of the structural seismic improvement of masonry buildings of the historic centres. The research started at the end of ‘90s in Umbria and Abruzzo regions (Binda et al., 2004a and 2004b), supported by the Italian Department of Civil Protection and the Ministry of Cultural Heritage, allowed to put in evidence the high vulnerability of the many historical centres struck by the Umbria-Marche earthquake in 1997. The site was hit by a previous earthquake in 1979, thus most buildings were retrofitted according to the seismic code in force at that time, which basically recommended the application of upgrading interventions and the evaluation of safety by using assessment procedures based on the favourable box-behaviour of masonry structures. Kinematics Models: Mechanical models able to describe the mechanical behaviour of structural components and assemblages (macro-models) both for in-plane and out-of-plane. The method is based on equilibrium equations which can take into account also the strength of the materials (crushing of masonry, tension in the tie, etc.). Kinematics chains can describe the in-plane rigid rotation of the vulnerable structural portions of the building, defined by particular geometrical (dimensions, openings) and bond conditions (connection, presence of ties), under in-plane horizontal actions. Cross Section Inspection: It is an investigation that should be of help in recognizing the constructive technique used for a load-bearing wall, mainly a stone masonry, observing how many layers are present and their connection. This information is extremely useful to understand the mechanical behavior of a masonry, mainly a multiple leaf masonry. Vulnerability Assessment: It is a process that defines, identifies, and classifies the security holes (vulnerabilities) in an existing building or in a group of buildings like historic centers. In addition, it can forecast the effectiveness of proposed countermeasures and evaluate their actual effectiveness after they are put into use. A key component of the vulnerability assessment is properly defining the ratings for impact of loss and vulnerability. Flat Jack Test: It is a minor destructive test used to assess the in situ mechanical properties of masonry under vertical loads. It is based on the use of a hydraulic jack made of light-gauge metal welded into a flat rectangular or semicircular shape that expands under hydraulic pressure. The test requires only the removal of a portion of mortar from the bed joints and is based on the principle of partial stress release. The test can be performed to define the in-Situ Stress (single flat-jack test) or to analyze the in-situ deformability of the masonry (two flat-jacks test). Volumetric Stratigraphic Analysis: It allows the subdivision of the building into homogeneous blocks, characterized by relative chronological relationships. Any block corresponds to a unique building phase, recognized by the observation of constructive details; its relationship with the other blocks may be “preceding” or “subsequent”, often with no possibility of an absolute dating. Critical connections between blocks need to be investigated, so to clarify the phases of expansion and transformation of the complex and so the most vulnerable points. MDT – Minor Destructive Investigations: They refer to a wide group of analysis techniques used to evaluate the properties of a material, component or system causing the minimum damage that can be repaired. They are usually used after the NDT on cultural heritage and existing buildings in order to have more direct information. Common MDT methods used in existing buildings include flat jack test, coring, drilling, pull-out, pull-off, evaluation of shear strength and bond strength of the bed joints, durability tests and others. Seismic Vulnerability: The proneness of some categories of elements at risk to undergo adverse effects inflicted by potential earthquakes. This kind of definition, which is definitely vague, requires of course considerable refinements in order to become an operational tool for various purposes, like estimate of seismic risk, development of earthquake scenarios, or development of strategies of risk mitigation. Multiple Leaf Masonry: It is a load-bearing masonry that presents its horizontal cross section made by two or more vertical layers. The different layers could be well or partially or non-interlocked and this constructive technique influences the mechanical behavior of the masonry. Stone Masonry: A composite material made by stone units and mortar (sometimes only stones), differently assembled and used for the construction of load-bearing structures. These materials have been used to construct many of the long-lasting, ancient monuments, artifacts, cathedrals, and cities in a wide variety of cultures. Load-Bearing Masonry: It is a masonry structure that bears a load resting upon it by conducting its weight to a foundation structure. It is among the oldest and most widespread building techniques in the world and characterizes many historic buildings. Collapse Mechanisms: By inserting a plastic hinge at a plastic limit load into a statically determinate structural component, a kinematic mechanism permitting an unbounded displacement of the system can be formed. For each degree of static indeterminacy of the element, an additional plastic hinge must be added to form a collapse mechanism. It is used in structural analysis and design. The formation of a single plastic hinge gives a collapse mechanism for a simply supported beam. Collapse occurs when there is no more remaining stable element that can carry the additional load. Crack Pattern Survey: It is a complete survey of the structural and physical damages that can help in understanding the vulnerable points of the structure and also the possible future mechanisms. All cracks should be clearly represented on the buildings elevation drawings, with their correct location and shape. The crack pattern survey must be carried out in order to interpret the type of damage and its causes. Damages which are frequently attributed to the earthquake can have a different nature and can be caused by excessive dead load or soil settlements, or simply to lack of maintenance. Sonic Pulse Velocity Tests: It is a nondestructive technique, based on the generation of elastic waves in the frequency range of sound (20 Hz-20 kHz), by means of mechanical impulses at a point of the structure. In the case of masonry, due to its heterogeneity, the pulse velocity represents a qualitative characteristic of the masonry. The velocity is influenced by the composition of the masonry as well as by the presence of inhomogeneities, voids and deteriorated areas, as well as the number of intersected mortar joints. NDT – Non-Destructive Investigations: They refer to a wide group of analysis techniques used to evaluate the properties of a material, component or system without causing damage. As they not permanently alter the article being inspected, they are particularly useful applied on cultural heritage and existing buildings. Common NDT methods used in existing buildings include ultrasonic and sonic pulse velocity, thermography, geo-radar, magnetic-particle and others.